So with being big animal lovers we usually have some big rules in our household when it comes to toys and the things we allow our furry family members to have. Usually we have a ZERO fluff and squeaker rule in the house because of how obnoxious they both can be when our dogs get a hold of toys as such. We decided to make an exception when the brand Quaker Pets asked me to review a few of their toys. 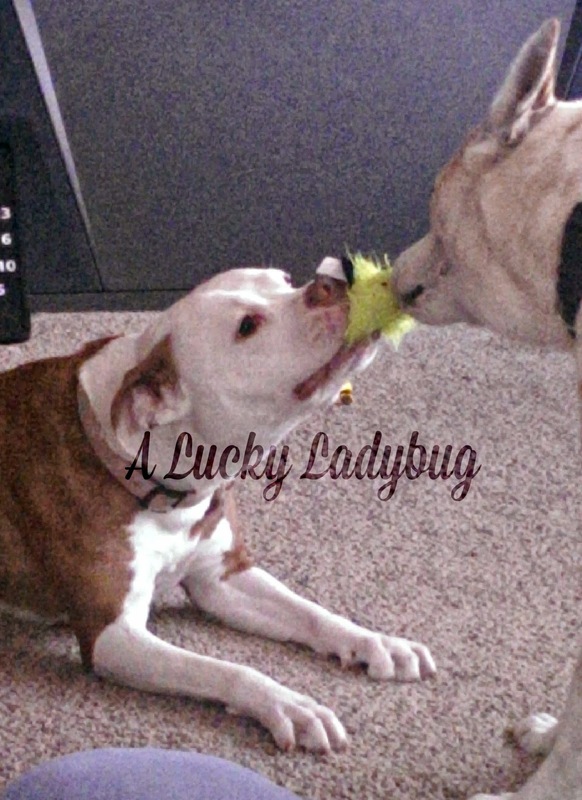 Because I had worked with them in the past, I knew my pups would be thrilled to "review" one of their products again. 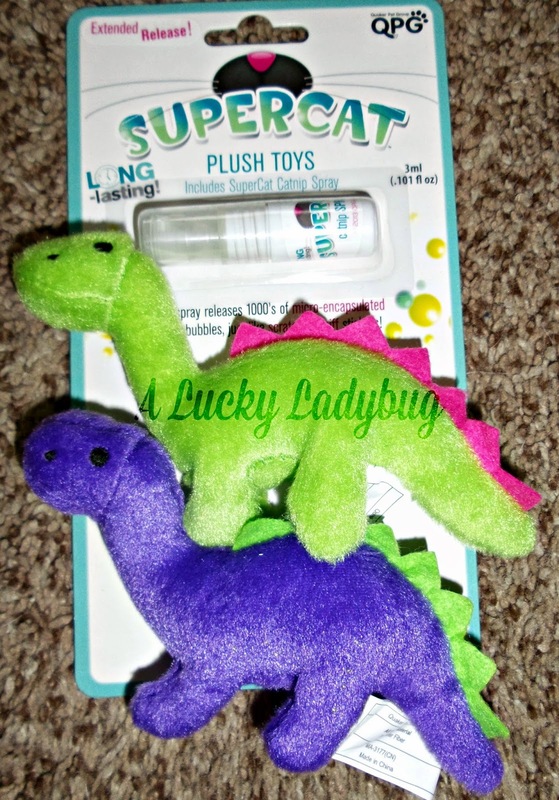 I was sent over three products from one of their brands, GoDoggy and a toy from Super Cat for Punchke! 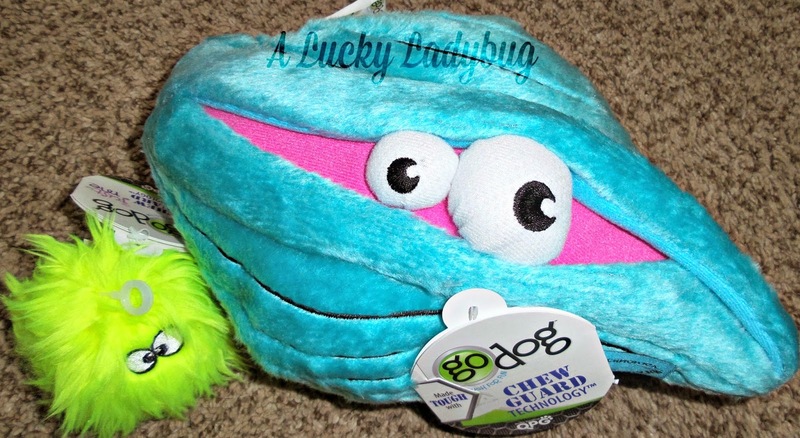 The GoDoggy products were a Lime Green FurBallz and the other a Clam Creature of some sort. I knew the dogs would put them to the test since these products say "Lined with Chew Guard Technology™ they will stand up to tough play!" I have to be honest though, the dogs had no interest in the Clam Creature. It had a squeaker inside it and was kind of cute in my opinion. I honestly think the dogs were afraid it might be one of the kids stuffed animals making it a no no for them to play with. We tried quite a few times to get them interested but they just weren't having it. Now, the FurBallz was a whole different story. 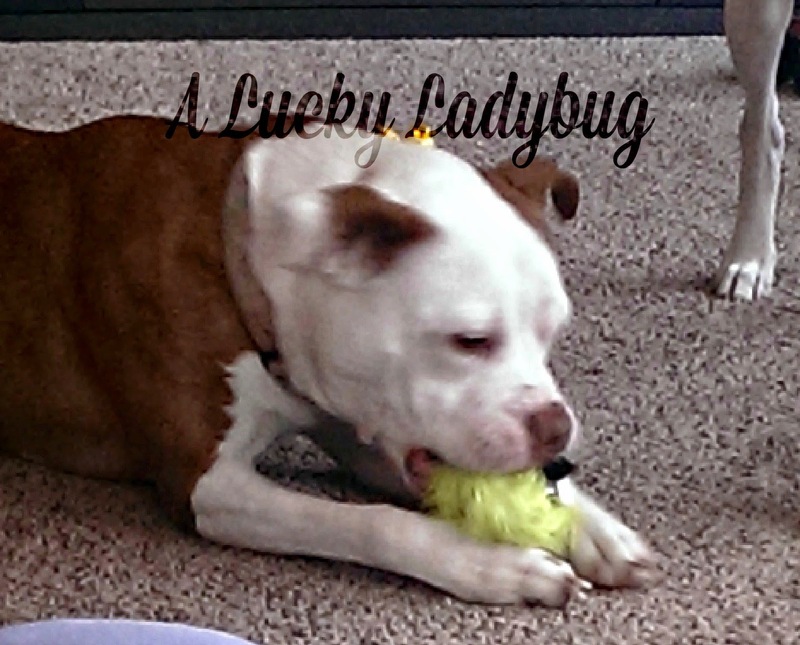 It has a squeaker inside and was exactly like the other types of balls they love to play with. Rayne was hooked on this thing and determined to get that squeaker out. It was absolutely adorable watching the two dogs play catch with each other and yes they really were tossing it back and forth. Although, we eventually had to throw the ball away because it got to be disgusting, it lasted for over a week in our house which was an accomplishment! "Using the same technology as Scratch N Sniff stickers, SuperCat™ products are “printed” with small bubbles of catnip that burst when cats rub, scratch or buff the material. This Nano-Burst Technology™ constantly releases scent when the bubbles are broken and will last approximately six weeks making for a long-lasting catnip experience." In the 14 years we have had Punchke, I don't think I have ever seen her stay as entertained with a toy for so long as I did with these. The Nano-Burst Technology™ truly seemed to last on the little dinosaurs we were sent over! 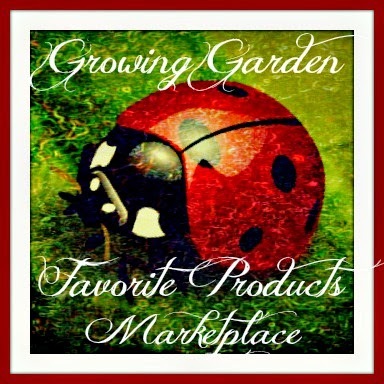 Recommendation: Totally love all of these products especially the dog toy FurBallz. I have been buying these toys since my first review since I fell in love with the HearDoggy toys without squeakers that humans can hear! 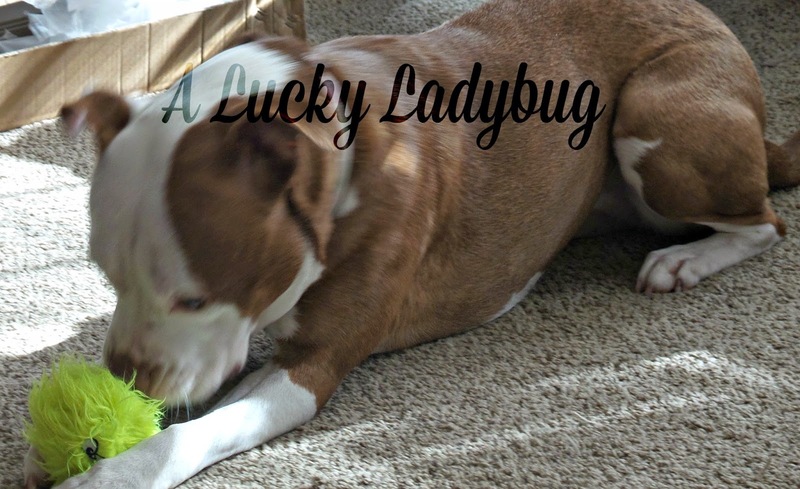 Giveaway: is going to give one of A Lucky Ladybug's lucky readers the same two GoDoggy toys for their pups to have of their own! We just recently got a plush toy that she for some reason hasn't torn to shreds...not sure why, but it was a gift from a friend of ours and I need to find out what kind it is so I can get more in the future! My dog loves a basketball. She chases it around the yard like she's playing soccer. My dogs love balls, especially tennis balls. My dog will chew anything to shreds. I like to give him those kinds of toys that he has to work to get the treat out of. They do have to be durable though, I recently gave him one and he just chewed it all up and got the treats. 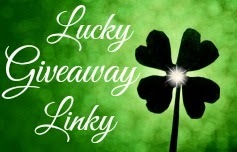 I love seeing pet giveaways as I love my meows & these are so helpful, I just hope to win one. 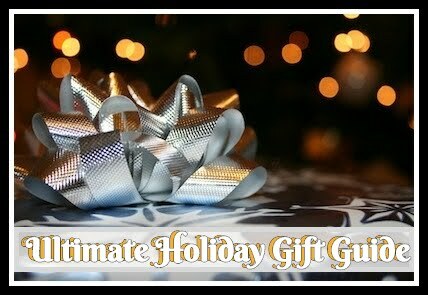 I love the layout & design of your blog!! My dog loves his chewy ball. I like the toys that do not have any stuffing. Kouga loves to destroy stuffed toys, but we hate cleaning up the mess. They love those Skineez squeaker toys that don't have the stuffing, just the squeakers. They love to play tug with them. The only toys my dogs haven't been able to chew up are Kong balls. My dog likes big hard things to chew on that squeak. My cats are endlessly entertained by the laser pointer. They also love the rings from milk jugs, and boxes are great fun too. My old Chihuahua doesn't like toys. Our you one love squeak toys and mini tennis balls. She can get really wired when she hears a toys squeak! Our Lab loves tennis balls, sticks, and stuffed animals. She loves to shred stuffed animals. She will carry one ones for weeks then suddenly decide to "kill" it. My pit, Zoe, loves my slippers. They look like bear feet, and they're her favorite thing in the world. I would love to find her a replacement! I found these rubber toys that you can put treats on the inside for your dog. My pets will spend hours playing with them and they never break. My dog likes a stuffed pig. My dog loves any toys that squeak. My two chihuahuas nurse on anything that is soft. Brownie's favorite is a green plush ball. our dog has a few kong balls that she loves to squeeze in her mouth and chew on. My dogs chew everything to shreds. But my pit likes the ropes. My dogs love all the toys and chew them all to shreds. My Pit loves the ropes. Knuckle bones,,,,both our furbabies love these.